A trip to New York City's American Museum of Natural History (AMNH) is a fun and educational experience for adults and kids alike. The museum offers a wealth of amazing exhibits, from dinosaurs to ocean life to outer space. The only problem is deciding what to see first. Here's our guide to making the most of your visit to the American Museum of Natural History, including info on tickets, collection highlights, location, and more. Location and Contact Information: The museum is located at 79th Street and Central Park West in New York City. Subway Directions: Take the B (weekdays only) or C to 81st Street. Hours of Operation: The American Museum of Natural History is open every day except on Thanksgiving and Christmas Day. Tickets: Tickets are on sale on-site or online. You must also purchase supplementary tickets for special exhibitions and programs, including the Space Show in the planetarium and IMAX films. The Dinosaurs: The museum's famous dinosaur exhibits attract dinosaur maniacs of all ages. Located on the fourth floor, the giant dinosaur fossils on display include a Tyrannosaurus Rex, Apatosaurus, Stegosaurus, and the new-for-2016, 122-foot-long Titanosaur. The Rose Center for Earth and Space, Featuring the Hayden Planetarium: The magnificent Cullman Hall of the Universe features access to the Hayden Planetarium, a sphere-shaped planetarium, where visitors can watch the universe displayed above and around them during unique space-themed shows. The Cullman Hall also has educational exhibits on the earth, space exploration, and the universe. The Milstein Hall of Ocean Life: See one of the museum's most celebrated icons, the 94-foot-long model of a blue whale. You can also see dioramas that bring you up-close-and-personal with other depictions of ocean life including dolphins, sharks, and giant squid. The Butterfly Conservatory: The Butterfly Conservatory is a popular annual seasonal exhibit that's typically open from December through May. Enter a garden buzzing with beautiful Technicolor butterflies and moths. 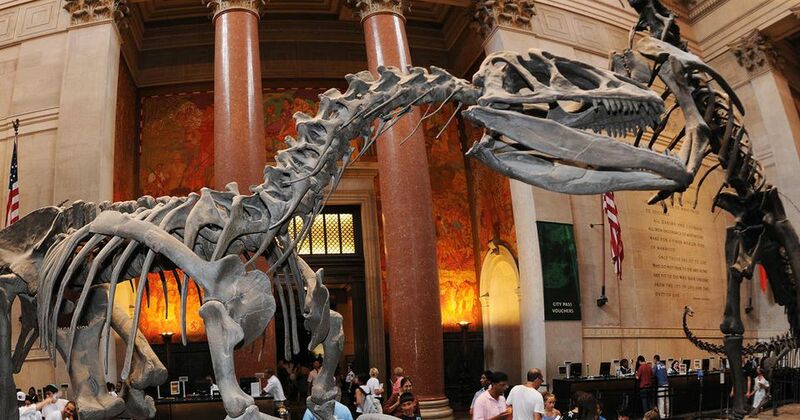 See everything from dinos to gems to zebras here in NYC!